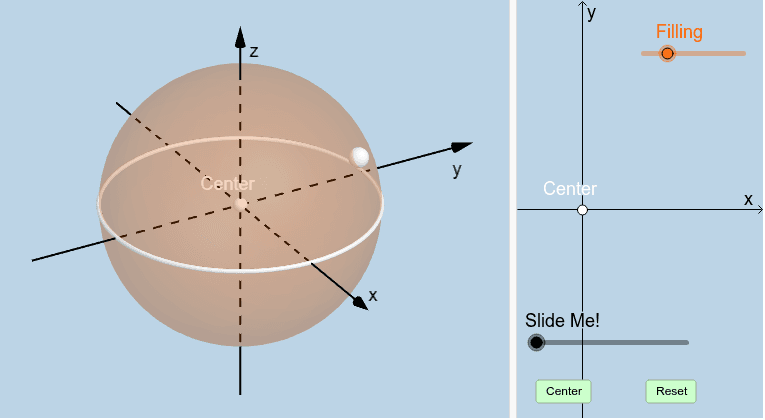 1) Open GeoGebra 3D app on your device. 2) Press the 3 horizontal bars (upper left corner). Select OPEN. 3) In the SEARCH TAB that appears, type D4hmNy9M Note this string of characters can be found in the URL here. Be sure to either copy & paste this code or type it just the way you see it here. 4) The slider named i does the animation. Slider e alters the opacity (shading of the sphere). You can move the white point on the sphere to change its radius when in 3D view.